A proliferation of new airport projects in the Maldives is destroying unique coastal ecosystems and threatens devastating impacts on communities and livelihoods. As many as 20 new airports, several accompanied by hotel developments, are planned and under construction, and many projects are government funded. In October 2017 a dredger, newly acquired by Maldives Transport and Contracting Company (MTCC) and at 92 metres in length the largest in its dredging fleet, began land reclamation for a new airport on Kulhudhuffushi, an island in the north of the Maldives. By early January 2018 land reclamation for the new airport was complete. Sediment dredged up from the ocean bed had been dumped on the largest white clay wetland and mangrove in the Maldives and destroyed a unique ecosystem. The Kulhudhuffushi mangrove system was the most biodiverse in the Maldives, hosting eight IUCN Red List species. Kulhudhuffushi mangroves had also provided a livelihood for over 400 people, predominantly women, and their families, who soaked coconut husks in the mangrove mud as part of a coir rope making industry sustained over many generations. The impacts of construction of Kulhudhufushi and two other new airports in the Maldives – on Funadhoo and Maafaru islands – are documented in an excellent booklet, Irreversible Damage, Destruction & Loss #SaveMaldives published by SaveMaldives a civic movement that has emerged in response to a government drive for new airports and tourism resorts. After destroying mangroves to make way for Kulhudhuffushi Airport MTCC was then awarded the contract to build facility’s 1.2 kilometre runway. Then MTCC’s new dredger moved southwards to Funadhoo island where it was deployed to reclaim land from the north west lagoon for another new airport. Upon completion of this operation MTCC was contracted to build Funadhoo Airport runway, apron and taxiway. Funadhoo is an environmentally sensitive area, sharing a reef with its twin island, Farukolhu, that includes extensive mangroves. Dredging and reclamation proceeded near to Farukolhu’s nesting grounds supporting several bird species and a bay that serves as a marine breeding site for sharks and rays. Construction of Maafaru Airport is nearing completion and test flights are imminent. Lush vegetation has already been decimated. Ecosytems highlighted as at risk in the Environmental Impact Assessment (EIA), and now irreversibly removed, include 20,000 trees, mangroves, marshland, coral colonies and seagrass beds. The EIA flagged up the necessity of relocating mangroves but there is no evidence that any such mitigative measure has been implemented. Maafaru Airport is larger than Kulhudhufushi and Funadhoo airports. Its 2.2 kilometre runway is long enough to accommodate Boeing 737 planes with a regular terminal along with facilities for parking private jets and a hotel. Maafaru Airport is part of a US$60 million agreement with the Abu Dhabi Fund to develop ultra-luxurious tourism in Noonu atoll. The Irreversible Damage, Destruction & Loss #SaveMaldives report draws attention to various aspects of regulatory failure which have allaowed airport projects without the obligatory safeguards. The Environmental Protection Agency (EPA) is supposed to act as an independent authority but has been stripped of its powers to regulate tourism-related projects, effectively becoming a ‘rubber stamp’ legitimizing destructive infrastructure projects. A key EPA task is to assess, approve and monitor compliance with EIAs, but new airports and tourism projects resulting in irreversible damage to fragile ecosystems have been approved. New airports already under construction in Kulhudhuffushi, Funadhoo, Maafuru are just the beginning of an ecocidal aviation expansion frenzy. The Maldives government is planning a total of 20 new airports across the archipelago. Land reclamation also looms for a proliferation of new tourism resorts. The aviation and tourism drive expansion drive is obliterating white sand beaches and pristine coastal ecosystems, the very assets that are key to the the popularity of the Maldives as a tourist destination. The concept drawing for a new airport on Fainu island shows the airport taking up about two-thirds of the island land area with the runway extending along the entire southern coastline. 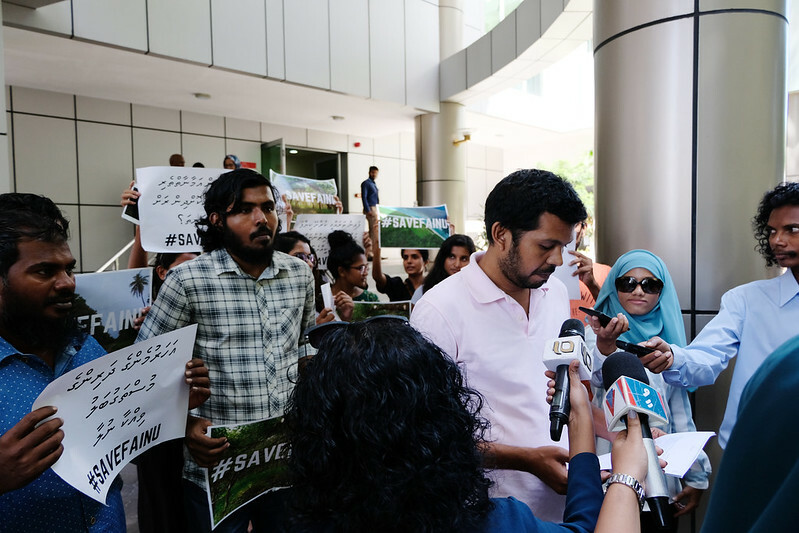 The Maldives Independent calculated that 31 hectares of vegetation would be lost, including a dense jungle area and agricultural land. The airport plan also includes about 4 hectares of land reclamation. Land earmarked for a gated hotel is shown on the map below as an area adjacent to the airport and shaded in purple. A woman speaking anonymously to the Maldives Independent said that rumours of an airport on Fainu island had circulated since she was a child, but all of a sudden the airport agreement was signed, funding allocated and work about to commence, yet even the island council did not have information. Another woman said “If they take our land for all of that, we will be boxed into the paopulated ares of the island like an open jail”. Residents also stand to lose access to 2.18 kilometers of beautiful beach to the airport security zone and hotel. Additional developments, namely a medical facility, hangar, lounges and restaurants have been mentioned. Islanders opposing the airport are concerned that even more land might be taken for a second hotel. Residents acted quickly to form a campaign opposing the airport, SaveFainu and a petition submitted to the Tourism Ministry, Universal Enterprises and Island Aviation was signed by 140 people, about half of the population of Fainu island. Universal Enterprises, one of the largest hospitality companies in the Maldives, is financing Fainu Airport through bulk purchase of advance sales of air tickets. Island Aviation, owner and operator of Maldivian, the largest carrier in the Maldives, has been awarded the US$8 million contract to develop the airport. The SaveFainu petition called for more transparency from the Tourism Ministry, proper consultation with islanders and an independent EIA. Mohamed Waheed, a leading activist in the SaveFainu campaign said some residents did not sign the petition for fear of losing their jobs, but are worried that such a large amount of the island would be lost to the airport and the secrecy and lack of transparency regarding the project. People are worried that loss of farmland to the airport would mean the loss of farming livelihoods. Waheed said job opportunities at the airport would not match the incomes made by people working on farms and pointed out that a comparable airport on Kudahuvadhoo island only employs 29 people. Land reclamation has already created space for a new airport on Muli island. On 11th July 2018 President Yameen pledged to develop an airport on Muli island and attended a ceremony marking completion of the land reclamation project. MTCC has been paving the way for an airport on Muli island for some time. A land reclamation agreement was signed in 2014 and reclamation of 40 hectares of land was reported as completed in May 2017. An aerial photo shows an ideal site for an airport runway already in place, a strip of reclaimed land running along almost the entire eastern shoreline of Muli island, encompassing the southern tip and extending along about a third of the western coast. MTCC has also been contracted to reclaim land for a new airport in Hoarafushi in Haa Alif Atoll, the northernmost atoll in the Maldives. The project, anticipated to cost over US$4 million, will be funded by the state budget. MTCC has already started development of an airport on Maavarulu island, a project costing US$ 3.7 million funded by the state budget, with tarring of the 1,200 metre runway scheduled to commence by the end of July. Maarvarulu is an island on Gaafu Dhaalu Atoll, where a second new airport is to be built, on Faresmaathoda, an uninhabited island situated on the south of the atoll. Tourism developer ‘Champa’ Mohamed Moosa, gave a US$4 million loan to the government to develop the airport and a press conference at the beginning of June marked the signing of a US$2.5 million contract with Gulf Cobla, a UAE based dredging company, to begin land reclamation for the project. Mohamed Moosa is chair of Kuredu Holdings, a major resort operator which has been awarded a contract to develop another new airport, on Madivaru island, in the tourism hotspot of Lhaviyani atoll, which will entail reclaiming three hectares of land from Madivaru lagoon. Kuredu Holdings is expected to develop a hotel to support Madivaru airport operations. More land reclamation, and yet another new airport, looms in Bileyfahi, where President Abdulla Yameen pledged to reclaim land and build a domestic airport, explaining that this additional facility, together with the new Funadhoo Airport, which is located just 40 kilometres away, will make Shaviyani atoll a tourism hub. The necessity of the new airports, many of which are generously funded by the government, is highly questionable. The Maldives already has 12 airports and all three new airports in the #SaveMaldives report are being constructed even though an existing airport is easily accessible by speedboat, a journey of 45 minutes in the case of Funadhoo Airport, 40 minutes on the case of Maafuru and just 25 minutes away from Kulhudhuffushi Airport. In a similar vein, SaveFainu campaigners regard an airport on Fainu island to be unnecessary as an existing airport in Raa atoll, 26 kilometers away on Ifuru island, can be reached by speedboat in just 25 minutes. The Maldives government continues its drive to build new airport projects even though the country is on the front line of the battle against climate change. Rising seas are lapping at the shores of many low-lying islands. The Irreversible Damage, Destruction & Loss #SaveMaldives report points out the inconsistency of the Maldives government on the international stage when in November 2017, Environment Minister, Thoriq Ibrahim, traveled to advocate for Small Island Developing States (SIDS) at the Alliance of Small Island States (AOSIS). A key issue for small islands is their vulnerability to rising seas caused by climate change. Yet the government driven and funded aviation expansion drive is a climate double whammy; with aviation expansion increasing greenhouse gas emissions from aircraft and land reclamation increasing vulnerability to climate change induced flooding from rising sea levels, severe storm surges and more intense rainfall due to removal of vegetation which serve as a buffer absorbing excess water. Destruction of mangroves for new airports compounds the climate impacts, because these unique ecosystems play a unique role in carbon sequestration, absorbing CO2 from the atmosphere and storing in their biomass for long periods and laying down soil that acts as a carbon sink. The Maldives government pursues environmentally devastating airport projects in the face of widespread opposition from civil society, even though it is a recipient of large amounts of donor funds for climate change mitigation and resilience. International organizations and development partners such as UNDP Maldives have remained silent.